A couple of weeks ago we hosted a party as part of KitchenAid’s 1000 Cooks For The Cure, to benefit Susan G. Komen for the Cure ®. I was introduced this great fundraising idea while attending the Rockher party Blogher Food this past May. The basic concept was that 1000 cooks sign up and throw a party, a potluck, BBQ, or just a small gathering of friends. When you registered your party you could dedicate it to a cancer survivor or mention any other reason that inspires you to assist in the fight against cancer. If the party raised more than $50 you’ll be sent a limited edition Villeroy & Boch plate designed by Jacques Pepin. But the best past is, you can help raise even more money if you register the plate and then pass it on to someone else to use! And for each time it’s passed, another $5 more will be donated! KitchenAid has promised to donate a minimum of $450,000. But with all the plates being passed on, we hope that number will be a lot more! For our party, we had a BBQ, grilling up the usual fare; burgers, hotdogs and making rotisserie chicken. We also had lots of fresh vegetables and some fruits on the grill. One of the dishes, a condiment, really, that went quickly was a Sweet Pepper Jelly that I had made during the week. It was gone in a flash! But thankfully, I made 5 jars so we’ll have some for the rest of the summer. It’s especially tasty on a juicy grilled burger. Bring to a boil and simmer for 8-10 minutes, until the apples are soft. Pour the mixture into a food processor and puree until smooth, return to the pot. To the puree, add the diced red peppers and Jalapeno peppers and bring to a boil. Add the pectin and cook according to the directions on the box. 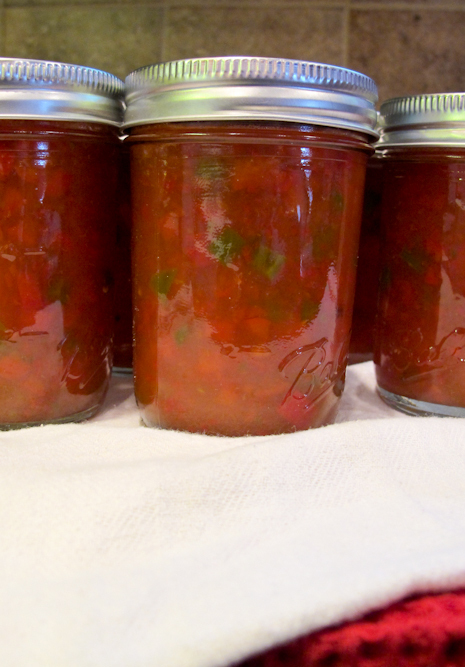 Once completely cooked, the jelly can be stored in the refrigerator or vacuumed canned in a water bath using sterile canning jars for long term storage. 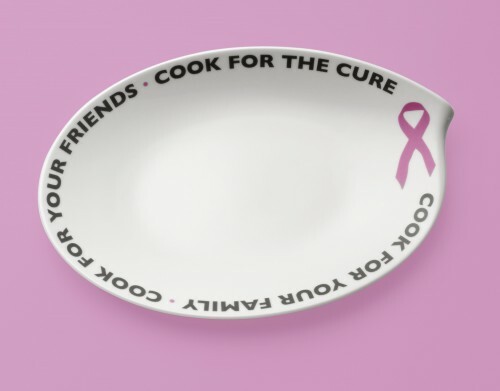 Now, you can do your part too, by purchasing Cook for the Cure Countertop Appliances by KitchenAid or by passing your own Pass the Plate by Villeroy & Boch. Once you have it, just go online , register your plate and pass it on. How excited were we, after having experienced our very first molecular gastronomical meal on a recent trip in Mexico, to hear about a contest sponsored by Simon & Schuster, Inc. to prepare a dish of our own in the spirit of elBulli and to celebrate Lisa Abend’s new book, The Sorcerer’s Apprentices: A Season In The Kitchen At Ferran Adrià’s elBulli. Well, I can tell you from the moment we found out about this contest, we started investigating all the different techniques and reading about all the different additives and their reactions with incredible focus and utter fascination. It was as though we were back in college and in Chemistry class. But this time, paying very close attention and longing for an “A”. If you would like to join in the fun, or want to check out the book, go here. Ferran Adria is one of the most influential and impactful chefs of our times. He created a new culinary language and taught us how to yearn for a higher level of cuisine and how to experience pleasure with every bite. He transformed our thinking and the way we understand food. By breaking down barriers and by using simple foods, masterpieces are born out of that desire to create the extraordinary from the ordinary. And what could be more ordinary than a street food that millions of people eat all the time? So for our first foray into this world extraordinaire called molecular gastronomy, we choose to recreate Chicken Satay. Hoping to construct an indulgence that would satisfy the staunchest of critics, we knew that each element must remain true to its original purpose. The sauce is a sauce; the salad is a salad. And the chicken, well, it’s still a chicken. Albeit, in a much more interesting form. To begin, we thought of all the components of a chicken satay as their own entities and then how they work together. The chicken is usually marinaded in a spicy sauce, served with a peanut dipping sauce and slices of cucumber. What if we gave that spice sauce it’s own stage and power to shine. We wanted to create a layer of spice in both the physical and metaphorical sense. It was then necessary for the chicken become a vehicle for that layer of spice after it had been gellified. Thus, we transformed chicken on a stick into a chicken mousse that could be eaten as single bites. Place all of the ingredients except for the heavy cream into a food processor and process well, stopping periodically to scrape down the sides. While running, slowly add the cream. Process until smooth. Transfer the smooth mixture to a bowl, cover with plastic wrap and refrigerate for a half hour. Preheat the oven to 375 degrees F. Butter a 6×9” pan well. Spread the cooled mousse into the pan with a spatula. 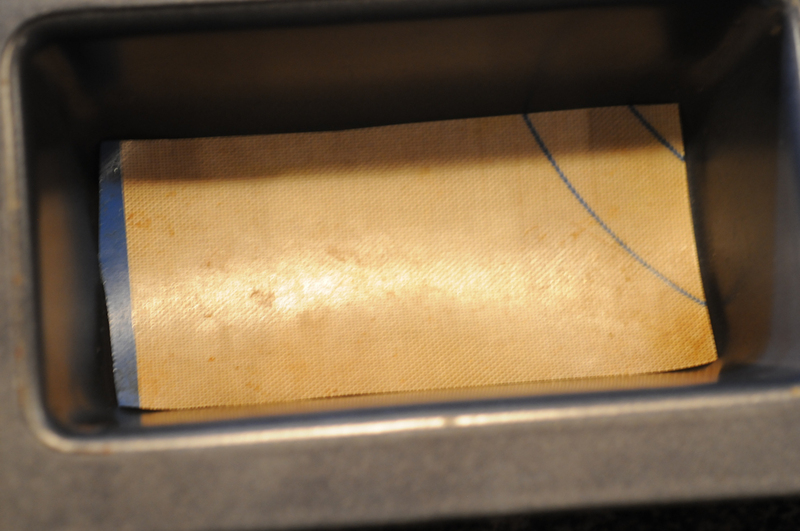 Cover with a buttered piece of parchment paper (butter side down) directly on the top of the mousse. 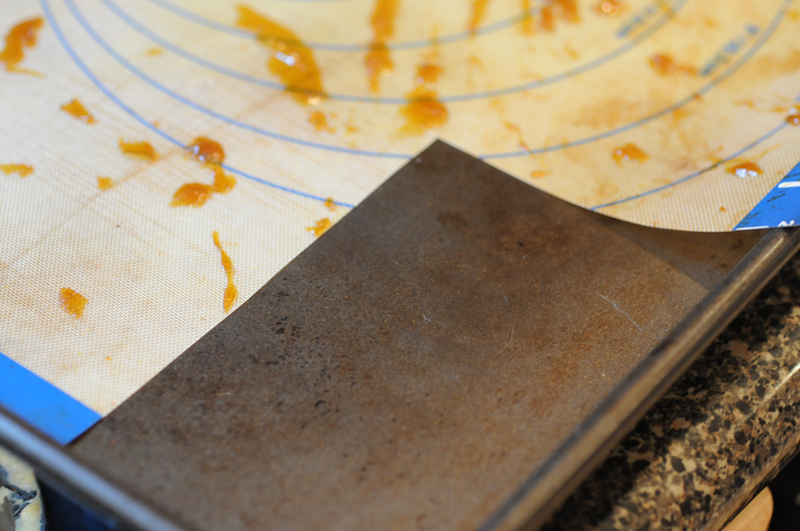 Place the pan inside a larger pan and create a water bath by adding water up the sides of the pan about ½ way. Bake in the oven for about 20-25 minutes. The internal temperature should be 165 degrees F minimum before taking it out of the oven. Remove from the water bath and cool in the refrigerator. Now it was time to create the Spice Layer using the Gelification method. 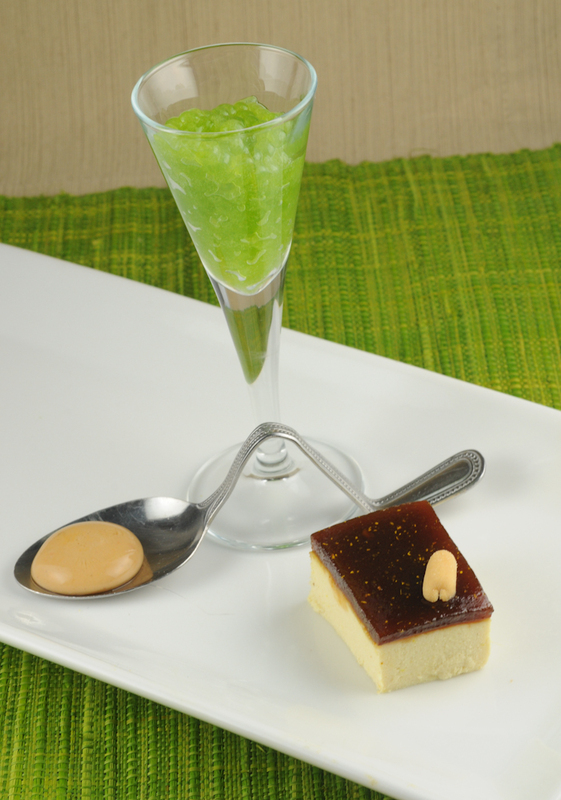 For this, Agar Agar, a vegetarian gelatin made from seaweed, is used as the gelling agent. In a small saucepan, over medium heat, simmer all of the ingredients to blend the flavors, about five minutes. Pour through a very fine mesh sieve into another small saucepan, discarding the pieces of ginger. This should yield about 140 ml of liquid. To this, add .98 grams of powdered agar agar or about 1/3 tsp. Mix well and bring to a boil for 30 seconds. It must boil continuously for 30 seconds. Pour the hot liquid into a small pan prepared with a silpat mat on the bottom. You must work quickly as it gels almost immediately upon contact with the pan. For our first try, we used a cookie sheet lined with a silpat but the sauce ran too much and while trying to spoon it towards one side, it solidified and became a gelatinous mess! Finding small loaf pans was ideal and sacrificing a silpat to make strips for the bottom appeared to be the best solution. (And a good excuse to buy a new mat!) 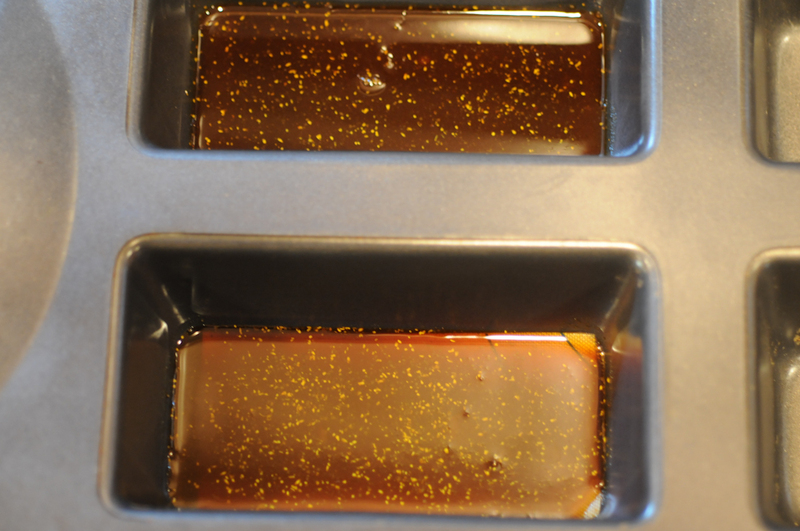 We poured the sauce into the pan about ¼” thick and set it aside to cool and completely solidify. The result was a beautiful translucent layer of spices that actually shimmered in the light and looked as if it were flecked with gold. Having mastered Gelification, we moved into the realm of spherification. In spherification, a small sphere, much like an egg yolk, is created that consists of a thin gelled membrane and a liquid center. The membrane holds its shape until broken and the yolk runs out. It creates a burst of flavor in your mouth. You allow the sphere to sit on your tongue and then pop it for the liquid explosion. It’s a grand surprise! 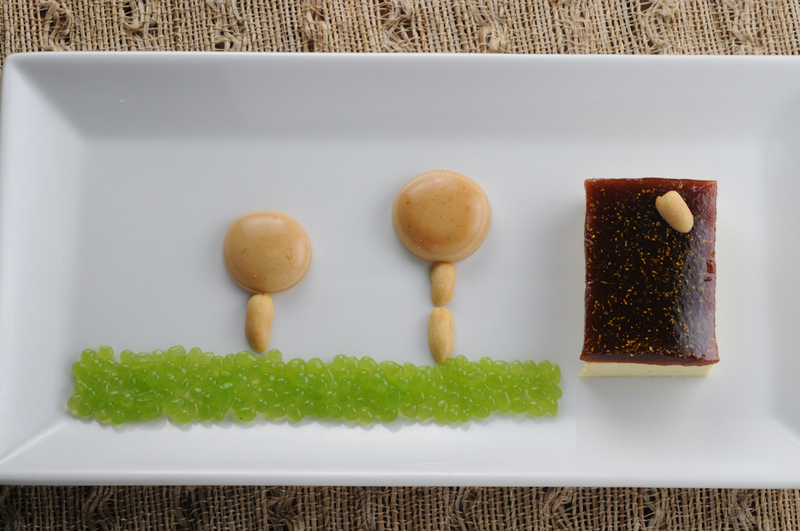 The only difference between Spherification and Reverse Spherification is the placement of the Sodium Alginate. If the Alginate is in the liquid of the sphere, it is called Standard Spherification and the sphere will continue to gel over time. If the Alginate is in the bath it is called Reverse Spherification and the gelling will stop with the formation of the outside membrane. We created the Peanut Sauce using Reverse Spherification. Begin by creating an Alginate bath and a water bath. Combine 1 liter of water with 6 grams of sodium alginate in a large deep pan. Blend thoroughly and set aside until ready to use. In another large pan, add plain clear water. This will be your water bath. Also set aside. In a small saucepan, heat the coconut milk over medium heat. Stir in the curry paste and combine well making sure to break up all the pieces. When you see the red oil simmering to the top add the rest of the ingredients and mix until combined and smooth. Continue cooking about 5 minutes more. Using a large spoon filled with the sauce, slide the sauce off and into the alginate bath to form a ball/sphere. This takes some practice and some patience to achieve beautifully shaped balls/spheres. Let the ball rest in the alginate bath for 10 minutes. Retrieve the ball/sphere with a slotted spoon or a skimmer and dunk into the waiting water bath. Remove to a large plate to drain and rest. The spheres are relatively fragile and will burst if bumped or shaken too hard with the skimmer. One way to alleviate this is to leave them in the alginate bath longer, but this solidifies the sphere more and reduces the amount of liquid in its center. Once you have created many spheres, you can set them aside in the refrigerator until ready to use. They can be rewarmed in a warm water bath when ready to use. Lastly, we created the cucumber salad that is traditionally served with satays using standard spherification method. We created lovely green cucumber caviar. Mix the Sodium Alginate with the cucumber juice and blend with an emersion blender until fully dissolved. Cover with plastic wrap and place in the refrigerator to chill. The liquid needs at least half an hour for the froth to dissipate some and for the liquid to become semi clear. In a large bowl, dissolve the calcium chloride in cold water and set aside. In another large bowl, just add plain water. This will be your water bath. In the bowl with the alginate, use a fine mesh sieve to catch the caviar. 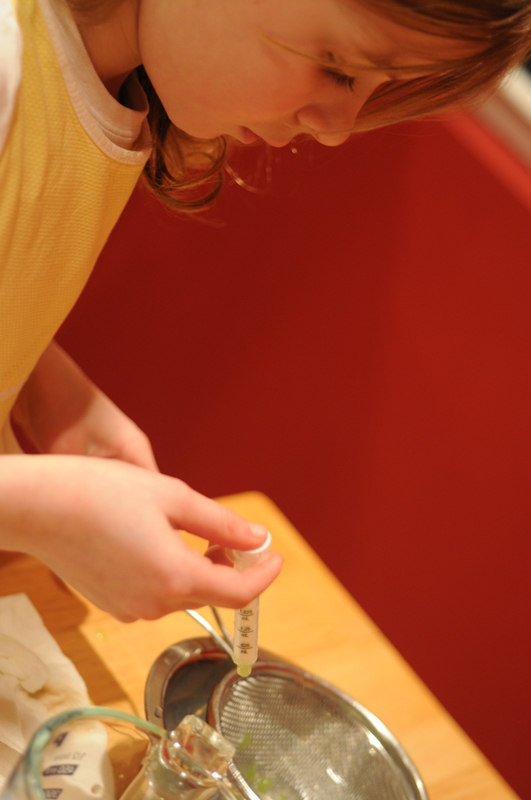 Fill a syringe with the cucumber mixture. Holding it close to the surface of the alginate water, expel the liquid, drop by drop. The cucumber droplets will form small balls the size of caviar in the water. Using your sieve remove the balls from the alginate bath and place them to rinse off in the water bath. Drain and place into a small bowl until ready to use. 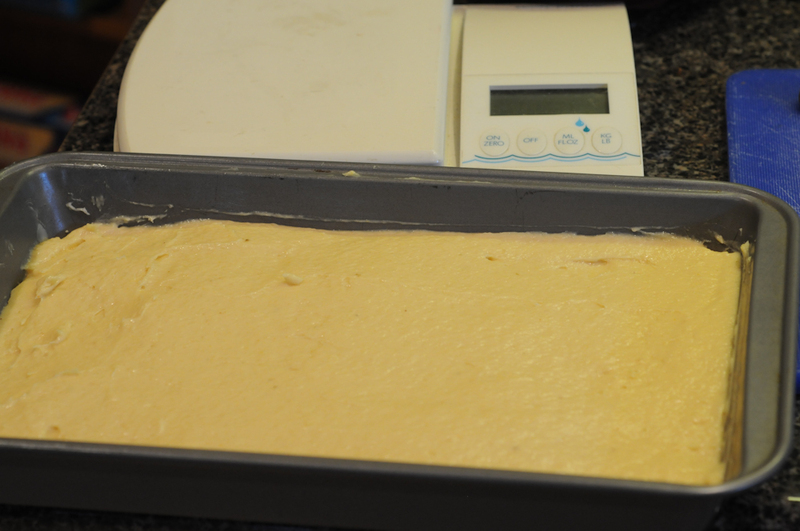 Cut a piece of chicken mousse that has been heated and is warm into a square. Slice a similar square out of the spice layer to fit the chicken piece. Set it gently on top of the chicken and then place half a roasted peanut in one corner. In the bowl of a spoon or other small dish, place a sphere of peanut sauce. Fill a small glass, such as a shot glass with the cucumber caviar. Serve immediately to wild applause. At the beginning of this project, the naysayers thought it would prove too difficult for a home cook, but as we found out, it was really very simple. (Even the children made caviar!) The four components for the satay turned each bite into a magical experience and the results were truly beyond even extraordinary. I’d say we passed Chemistry class. Note: This post is being used as a consideration in The Sorcerer’s Apprentice recipe competition. If you’d like to take an inside look at elBulli, check out both the contest and the book HERE. 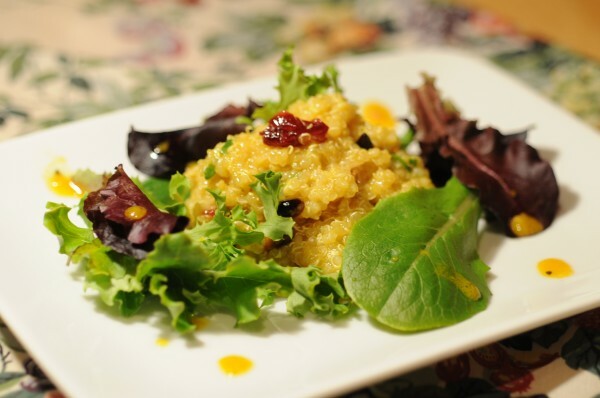 Our curried quinoa salad is a variation on this recipe from Jennifer of Savor the Thyme. She was motivated to try something new from My Spice Sage, Goji Berries , for her December Progressive Party submission to Kitchen Play. While we did not happen to have any Goji berries today, we did have dried cranberries and they added that sweet, chewy texture along with the other zesty ingredients to our quinoa salad. Here’s our take on this very easy, yet very tasty dish that would be perfect served as a salad or as a cold side dish. The vinaigrette is delicious and would make an excellent marinade for chicken or seafood as well. Combine the quinoa, chopped spinach, dried cranberries, pine nuts, and the apple. Set aside. Wisk together the ingredients for the vinaigrette until blended. Combine the quinoa with the vinaigrette until it is well coated. You can now serve it alone as a cold side dish, or top with lettuce and serve as a salad course.